Clean Energy Pathways, Inc. (OTC Pink: CPWY) is engaged as a green energy and alternative fuel company. Shares of the green energy company are skyrocketing 236.36%, through early trading on Wednesday, July 5, 2017. 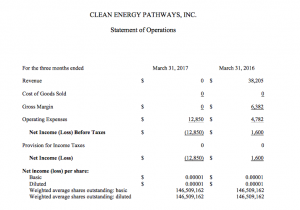 Over the past month, Clean Energy Pathways, Inc. has seen average daily volume of 14,146 shares. However, volume of 1.86 million shares or dollar volume of $5,580, has already exchanged hands on Wednesday.